It’s not every day we get to create a website for a cathedral! 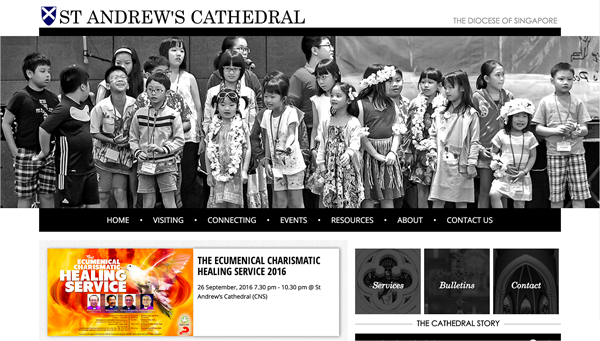 This month we were thrilled to launch the redesigned site of St Andrew’s Cathedral in Singapore. This was a redesign in every sense of the word: the fresh look is a dramatic change from the old site, but we also put a content management system into place, replacing the flat-file Dreamweaver site that was such a bear for staff to update. St Andrew’s Cathedral is a thriving Anglican community with a diverse and busy congregation. Their new website is similarly complex—home to a chockfull event calendar, weekly audio sermons (also available as a podcast), and Vicar Writes, a weekly column by The Revd Canon Terry Wong. And don’t miss Courier Online, a blog featuring writings by clergy and congregation. The first few posts are an intriguing mix of testimony, historical writing, and news. Since the old site had been maintained by hand, cathedral staff needed updating to be a quicker and easier process, if only to keep up with the many cathedral activities! We set them up with our favorite content management, ExpressionEngine, and got to stretch our muscles with our first implementation of ExpressionEngine 3.4.2. In addition, St Andrew’s wanted to be able to cater to the increasing number of visitors who visit the site on mobile devices and tablets. Every page is designed responsively so that the site is only readable and attractive on smaller devices, but the functionality shifts so that it is also easy to use whether the visitor is wielding a finger or a mouse. The final result is a site we all feel proud of, with the flexibility to feature any piece of content on the home page, but with enough complexity to allow staff to create small interior verticals from groups of pages, as with this tour of the cathedral’s history and facilities.